I was on the ice well before daylight searching for fish in an area that I had never set foot on before. I had been around with my boat but without catching anything I wasn’t all that impressed. The weeds were limited and from what I saw on my side imaging, structure was almost non existent. I shredded a 100 yard long section in a grid pattern and started hole hopping. It was still dark and before dropping a jig I had marks on my flasher. They weren’t moving so at first I figured that I had found a cluster of weeds. As my jig broke the bottom of the ice though, the top line moved up quickly. Within only seconds of wetting a line I iced my first crappie. It was nothing to write home about but the 9″ crappie swam away unharmed. 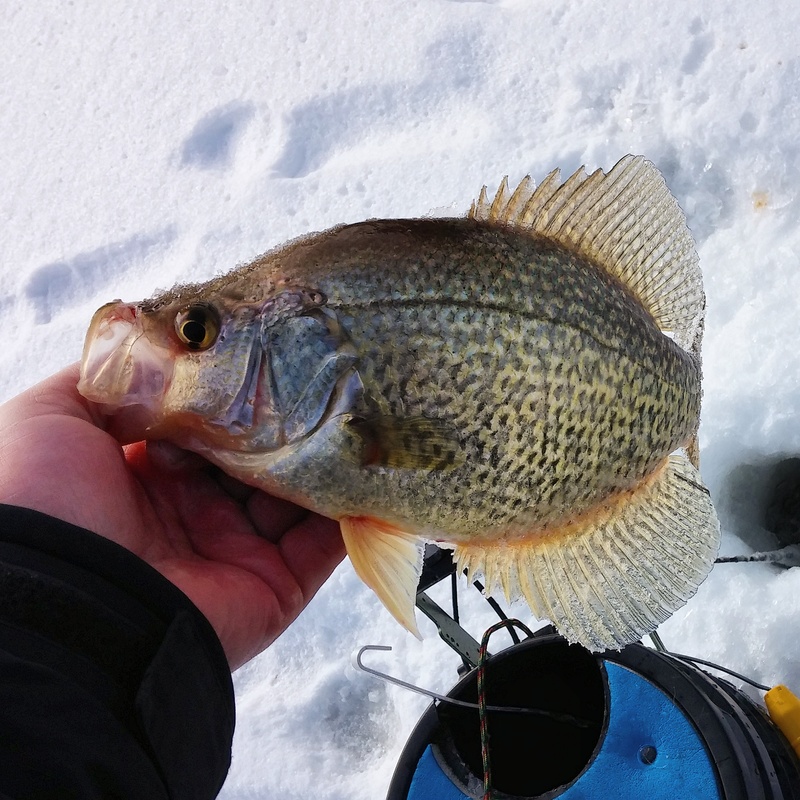 For the next few hours, I put crappie and crappie topside ranging from 7-14″. The were hungry and very aggressive. Until about 2:30, I spent the entire day on the water by myself. By this point I had handled a couple hundred fish and was ready for a break. I packed up my gear and made my way back to the truck without giving my location or success away. The day was bright and the water was murky. 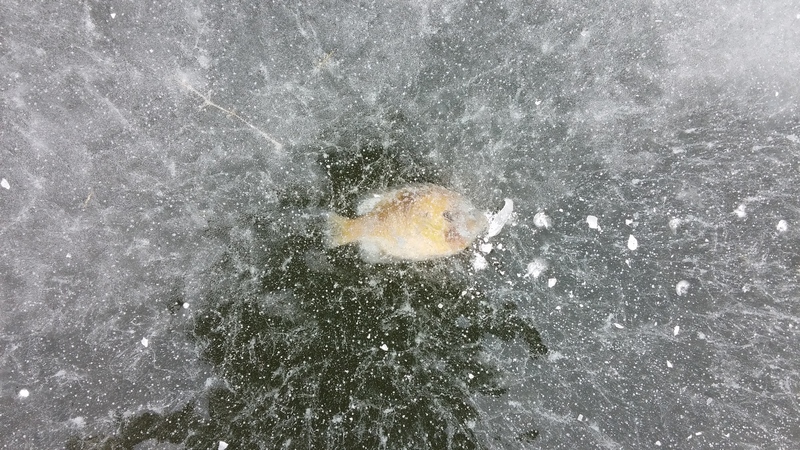 I found that anything bright worked well but the second something was dark under the ice the fish shut off completely. I also found a location where the fish are not spooky at all. They actually enjoyed noise. I found the best holes were the ones that skimmed over hard and I had to kick open. As soon as I stomped my feet, the fish came running! After a semi successful first trip chasing walleye, we decided to take another stab at it. We decided to fish the exact same body of water, same reef, same everything. This time however we were able to get set up a little sooner in the day since we had updated our GPS location on our Navionics app from the previous trip. Our 21 lines were set and baited by the time the sun peeked over the hills. Our expectations were high and we felt confident the action would be fast right off the bat. Well, we were wrong for the most part. 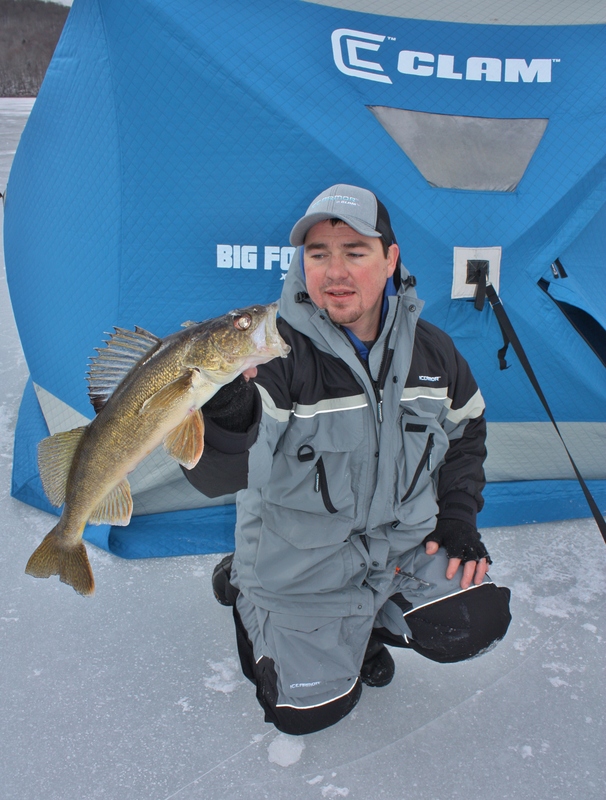 Just after getting set up our first flag fired and we were able to land a nice fat walleye just under the legal length. We were off to a great start, however, from there we went a few hours without getting another flag and quickly became a little discouraged. One thing that we’ve learned over the years of trying new spots and new techniques is not give up. Being discouraged is tough to handle but can be a good thing to experience as long as you use it to figure out what you might be doing wrong. Something had to be different so the conversation was started as to why the fish weren’t acting the same as they did the week before. We soon came to two major differences. Walleye, and their feeding habits can be severely altered by the moon phase. This trip was right between full moons while the week before we were directly following a full moon. Walleye love to feed during a full moon, a “no moon”, and for the three days or so on either side. We were in limbo with this trip, well after the full moon and enough before the “no moon” phase that the fish weren’t super active. The fish still bit but not as consistent as the week prior. Another important detail that we determined was a factor was the pressure. Now I know when you hear pressure you automatically think barometric pressure. 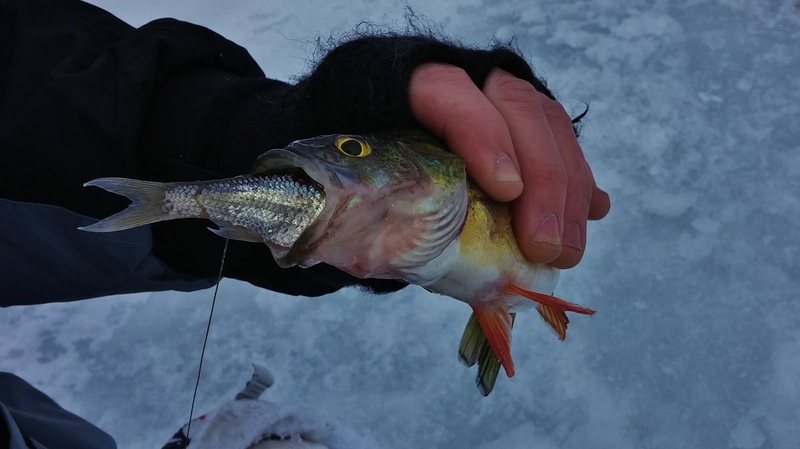 We’re talking about fishing pressure, and not even so much the number of people on the ice but the amount of noise top side really seemed to impact these fish. The first trip we had flags go up and barely spool out any line. Often times this is a sign that we surely had a walleye. Makes sense now. On the first trip, we were the only people fishing, noise was minimal, fish were relaxed and feeding. The second trip consisted of 14 plus fishermen in the area we were fishing and two of the groups were using ATV’s to check their lines. What tipped us off to this was this time when a flagged tripped the spool was burning. The fish were spooky from the noise, they were still feeding but they didn’t sit under the hole to eat the bait. They were on the run once they got the bait. 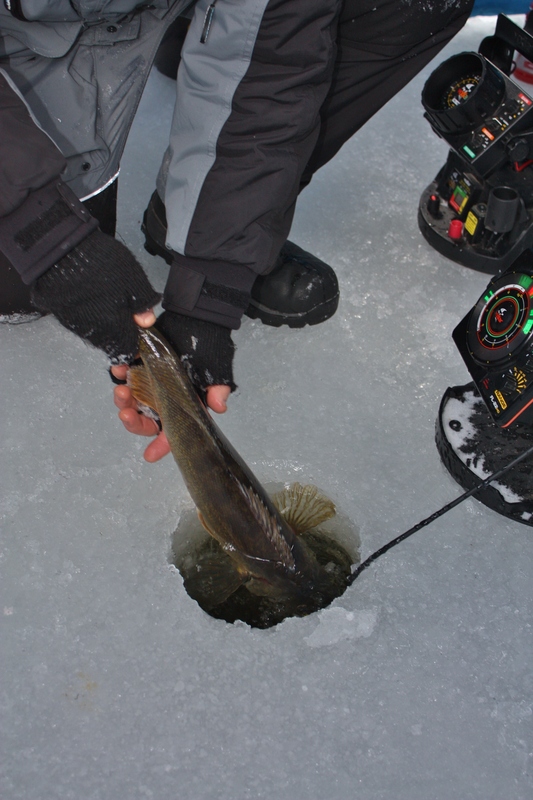 Walleye are very sensitive to noise and the phase of the moon! Remember that next time you target them and hopefully you’ll be able to put a few more on the ice. Champlain can be a tough place to stay motivated but its a great place to hone in your hook setting skills when you find the fish. With the fish constantly moving being able to get on them can be quite the chore. We mainly fish the islands for the giant pumpkinseed that roam the shallow weedbeds but on this trip they were no where to be found. The day started well before sunrise and with holes cut, we started hopping around trying to find a hot hole. I was on the ice with my buddy Andy and his two younger brothers. It seemed that the entire area that we shredded held fish you just had to sort through a ton of smaller ones. The ratio seemed to be 1 keeper for every 5 fish caught. There were also a ton of bass and pike around! As we fished in circles, the fishing never picked up or slowed down. It was constant catching all day. Every once in a while you would you could get in a hole and pop a bunch of fish with decent size but that was rare. The biggest trick to the day was to stay high in the water column. 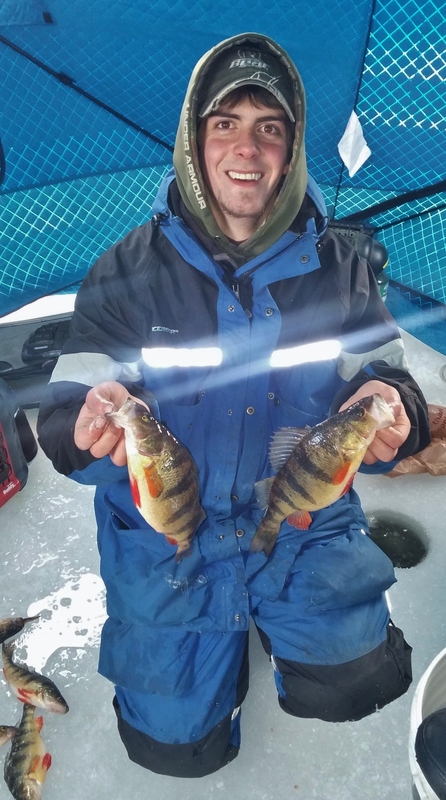 While the crappie bite was lacking, the larger gills seemed to cruise above the smaller ones. 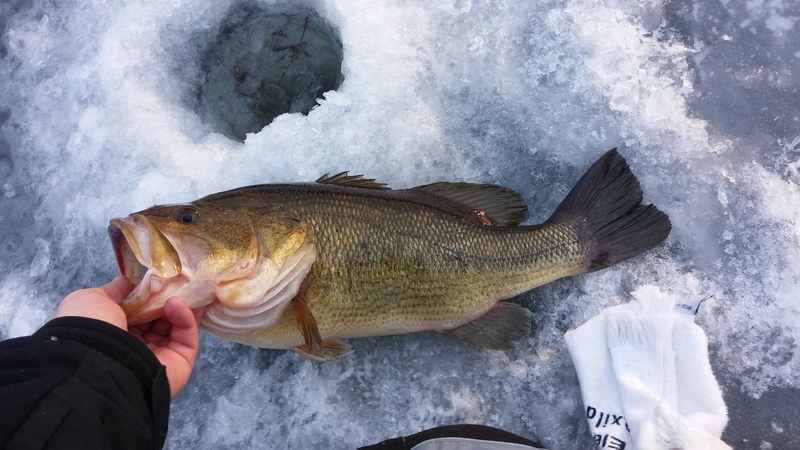 As things started to wind down for the day we had iced some nice fish and got some good pictures. The wind had blown all day and our faces and hands were beyond ready for a break from the cold! As a new year started, we decided to embark on a new adventure. As outdoorsmen, the two of us are constantly trying to learn and expand our knowledge. For a few years now we have been talking about Walleye. 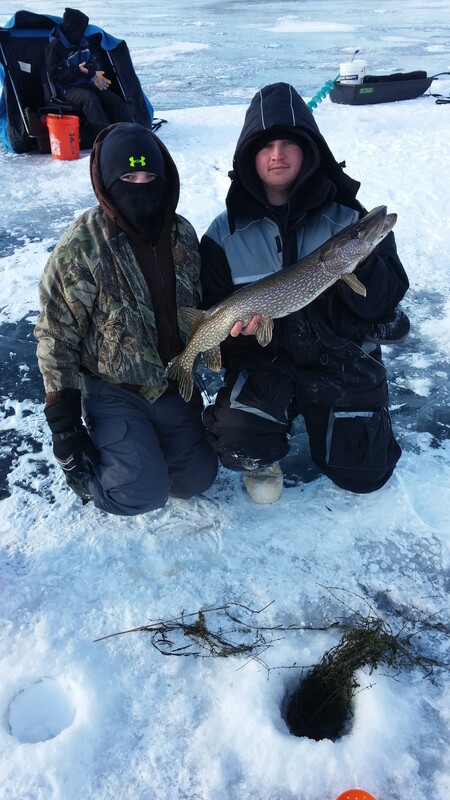 We’ve done our work in the spring, summer, and fall months to consistently locate decent numbers of fish but have yet to dial them in the through the ice. The first body of water we hit was one that we spent some time on with a buddy who knows how to catch walleye. 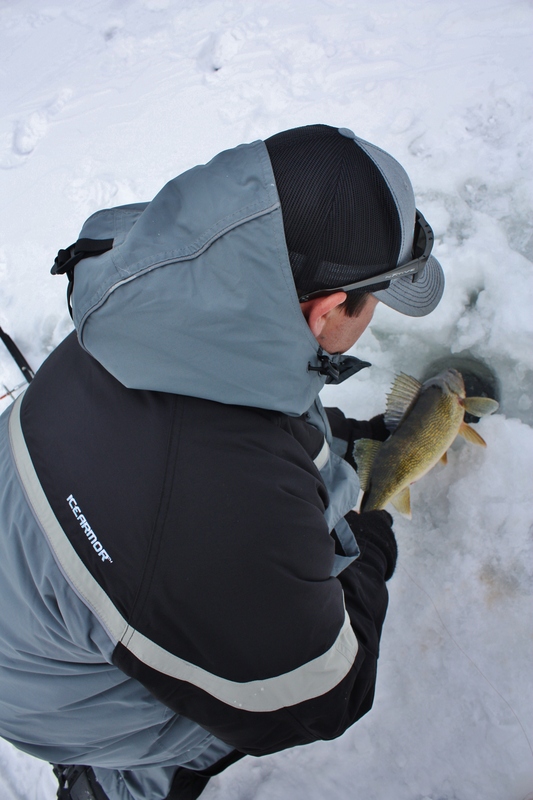 Through several trips we located located humps, deep holes and other subtleties that might hold fish come ice-up. With that knowledge and a few tips from our local walleye “professor”, we plotted a course for an early morning walleye bite. Arriving to the water well before daylight, darkness and excitement filled the air. If you haven’t looked into the Navionics app for your mobile device you should. By using this app we were able to input coordinates which would take us directly to a small hump/ledge as our destination. We drilled holes surrounding the structure hoping to catch fish as they slid up down and around the structure to feed. Our presentation was nothing special. We used tip ups with large shiners staggered in depth within a few feet of the bottom. 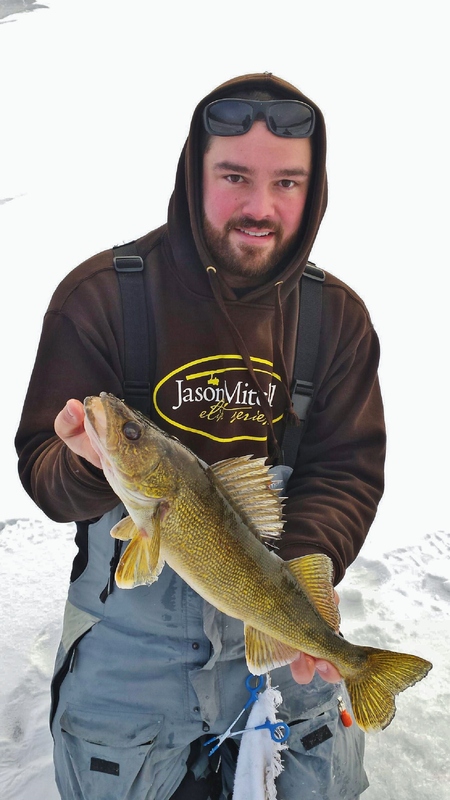 We set from 11 feet of water out into the mid 20’s hoping to cover as much water and as many walleye locations as possible. We were maybe halfway through our set as the first flag went off. After a brief struggle, the first fish head of the new year filled the hole and Dylan was holding a beautiful 21 inch chunky walleye. 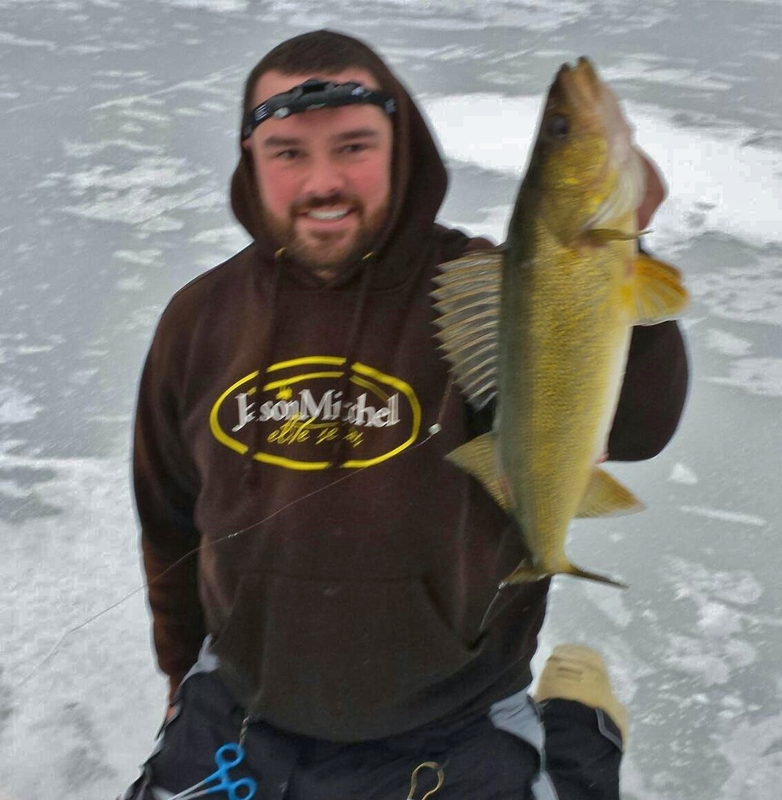 Getting that first fish on the ice sure did feel good. Something totally new to us and we didn’t even have lines in the water for 10 minutes! 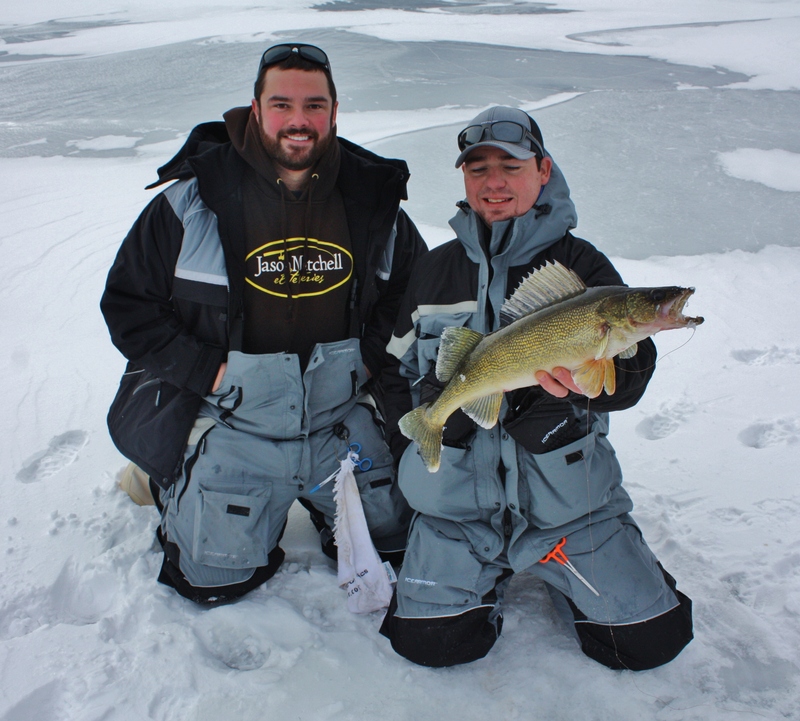 While still celebrating the success, Bobby and a close friend of D&B Mark, both landed a nice walleye each within 15 minutes of Dylan icing the first. Boy it sure was shaping up to be a good day! As the day progressed the fish seemed to slide into the deeper water as did our baits! The majority of our morning flags came between 15-20 while mid day flags were mainly between 22-28 FOW. The bite slowed as the day wore on but we were having action just about ever half hour minus the constant pestering from the perch. Around 1, we had to start heading home as we had run out of bait and were pulling unbaited traps from their holes. 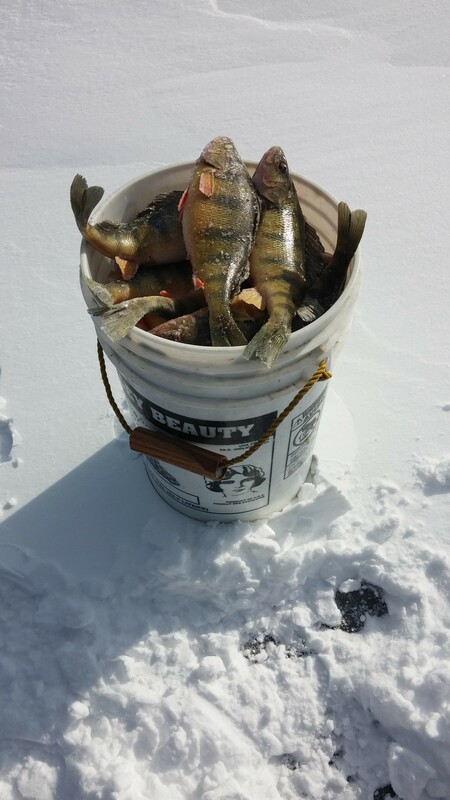 We released a bunch of nice walleye and took home some slabber perch. It was a great start to the new year and I’d say we have the confidence to run this pattern elsewhere that we explored this past summer!